We’re the ones who brought cats into our homes, but we know the real truth: They completely own us, in more ways than 12. Seriously, we are total suckers and sometimes complain about the hold they have on us, but secretly (or not so secretly), we love it. Most of the time, anyway. My cats have me on a pretty short leash. 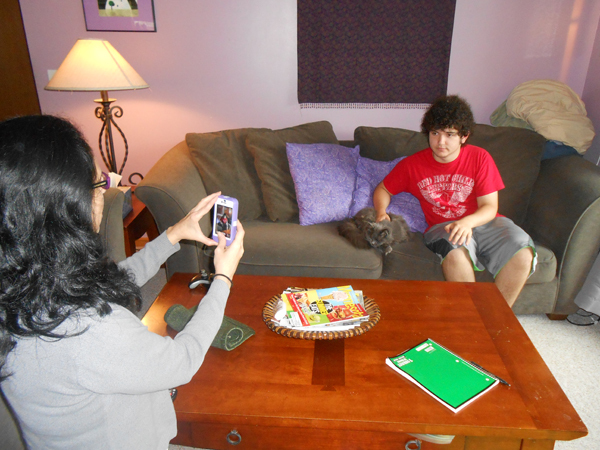 I think I have a plan about something, but then a cat enters the picture and I become an obedient minion. We’re all minions, really. Minions with access to the treat jar. 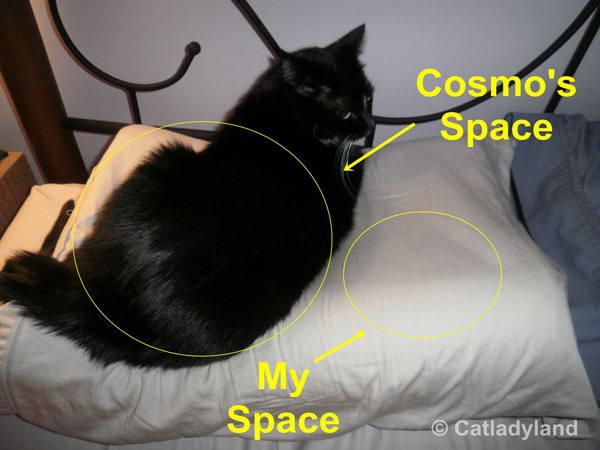 Here are five ways my cats completely own me. So I had this really great fuzzy, oatmeal-colored hooded sweater. Had is the operative word here. I didn’t wear it very often, but when I did, I felt extra cozy. One day I happened to leave the sweater sitting on a dining room chair, and that was all she wrote. Phoebe created a nest in the sweater and spent the next several days curled up in it. I couldn’t bear to take it away from her. 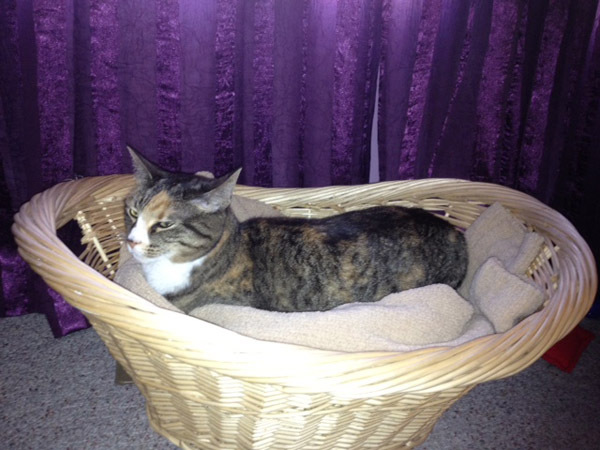 Instead I said goodbye to the sweater and placed it inside her favorite basket. I’m always on the lookout for a good cat pic and will drop everything if I happen to see one of the cats looking especially cute or funny. Honestly, it doesn’t matter what I’m doing — I immediately grab my phone or camera and aim toward the cat. Once I was on an important business call and found myself balancing my phone on my ear while going in for an adorable shot of Phoebe lying upside down in a sun puddle. Cats win every time. Cosmo is a giant pillow hog. Sometimes I wake up in the middle of the night to find him occupying about three-fourths of my pillow. Do you think I move him? Do you think I even scoot him so I can enjoy a full half of the pillow? No way. I make due with my little triangle of space and then take an ibuprofen for the neck ache I’ll probably wake up with in the morning. I work on deadlines and my day is pretty full. Because I work from home, I get to enjoy the company of my cats while writing. This, my friends, is good news/bad news. I love nothing more than having a cat in my lap; however, they often demand more than just a cozy spot on which to sleep. Phoebe and Cosmo demand snuggles and attention from me throughout the day — especially if I leave my desk and walk anywhere near my bedroom. Phoebe immediately meows like a mad cat and races into the bedroom. She jumps on the bed and stares at me, demanding a snuggle. How can I refuse? And Cosmo does the same thing at the desk. He stares at me until I invite him up, and then he wants to rub all over me and make biscuits on my legs. This, of course prevents me from doing anything productive. Cats get what they want — that’s just how it goes. Our house has intense sun exposure in the afternoons — I mean, sometimes it feels like it’s been enveloped by the fiery flames of Hades. And in the wintertime the sun is so low that it shoots through my window and nearly blinds me if I’m sitting in the right — or wrong — spot. Because of the heat and risk of blindness, I usually close the curtains during a certain part of the day. 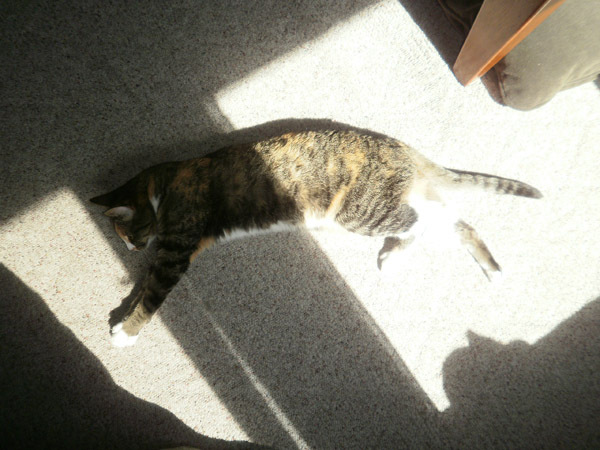 The cats, of course, love the sun puddles and take full advantage of an afternoon of sunbathing. So, guess what? I often leave the curtains open, remove a layer of clothing and put on sunglasses … all for the sake of the cats. 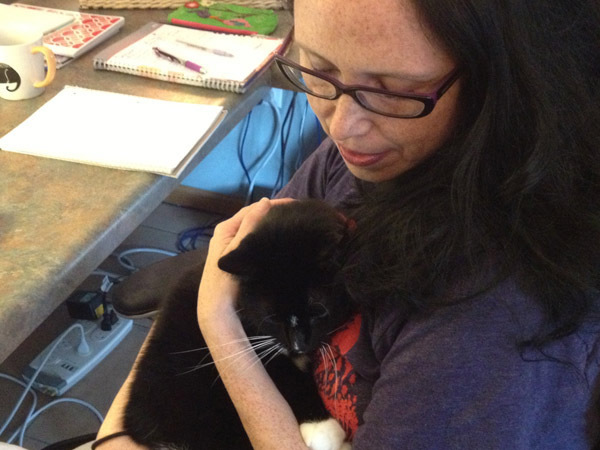 How do you know your cat totally owns you? Tell us in the comments!